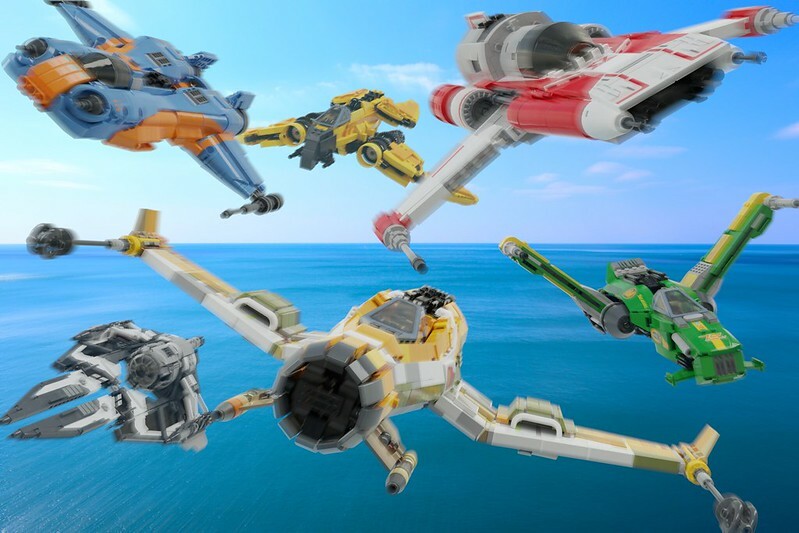 The starfighters from an underrated little cartoon called Star Wars: Resistance... All six of them. 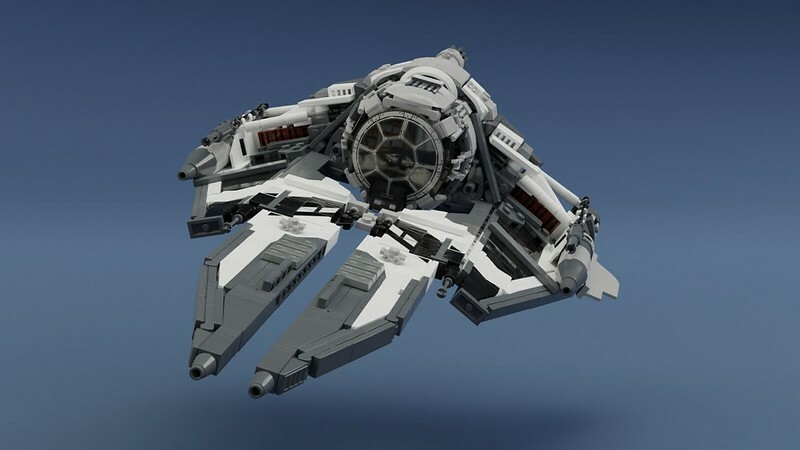 When the official LEGO sets of Major Von Regg's red TIE Interceptor and Griff Halloran's Black Ace starfighter were announced, I was disappointed at the lack of Fireball. This prompted me to start building my own. 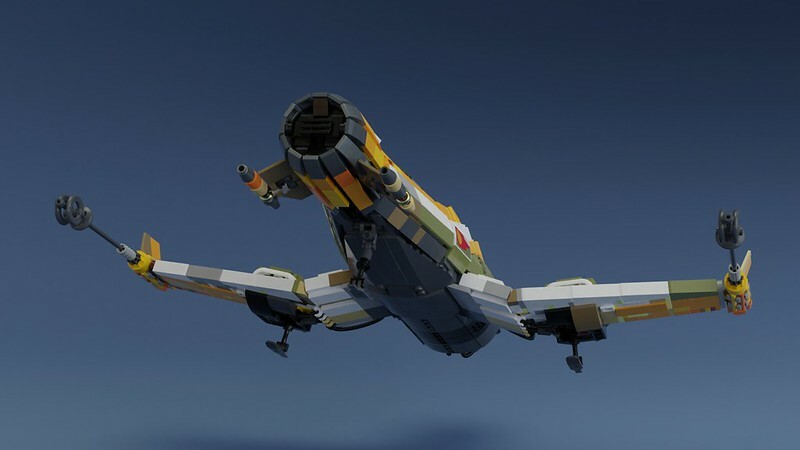 Whenever I hit a wall, (which was a lot), I started working on another starfighter from the show. Eventually I decided to build all the Aces, because they're all such amazing fighters. Blue Ace is the second one I started building after starting the Fireball, but with little progress since its front was very difficult to design. Green Ace was next, and I finished it in one session, and then later designed custom stickers for all the decals. Black Ace proved quite a challenge, with a lot of SNOT, slopes, and angles particularly around the cockpit/fuselage area. 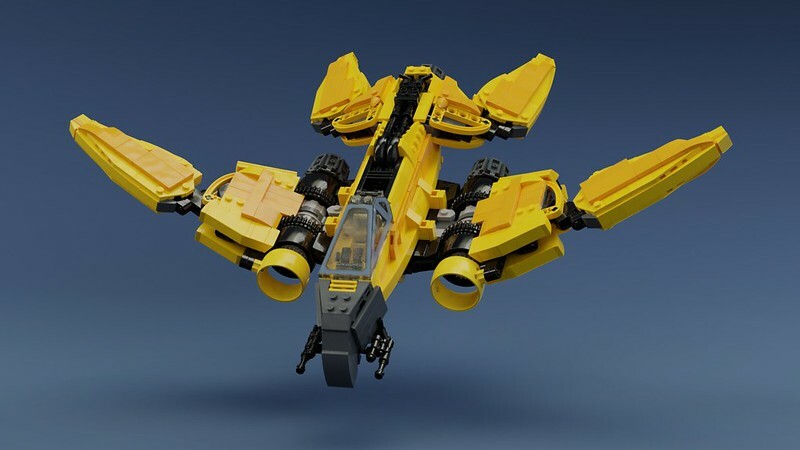 I then returned to the Fireball, built the wings in a similar fashion to my old Z-95 Headhunter MOC, but implemented ancient Technic plates and bushes (with the teeth) to capture the bend in the wings. The fuselage from the font intake (is it an intake? I don't know) to the wings was difficult with all the many angles I used to give it a round yet rough shape. Luckily Mixel joints are extremely useful. I hit another wall behind the cockpit and conjured up Yellow Ace and Red Ace quickly since they were relatively simple to design and build. I even started on parts of Blue Ace. Once I finished the Fireball I spent a whole week on finishing Blue Ace, which resulted in a lot of headaches. But these were finally finished and here we are. These racers are in relatively the same minifig scale, but some like the Fireball and Blue Ace ended up towards the bigger side. 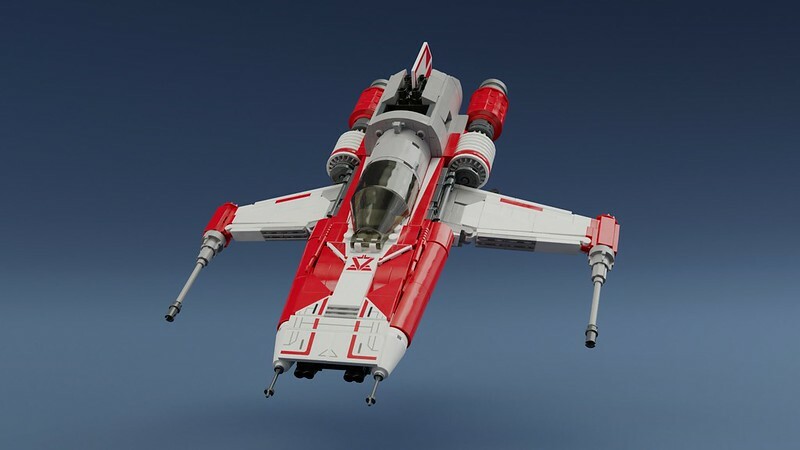 Each have retractable landing gear, which is mandatory when it comes to building starfighters. Sorry about the lack of minifigures and droids, but you know. 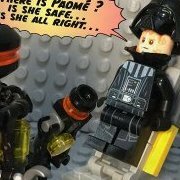 Building ships is one thing, making minifigures that don't exist is another. A flashy racer that was surprisingly easy to design and build. The hardest part was replicating the sponsor decals into custom stickers, thankfully this was possible by concept art made available on starwars.com. 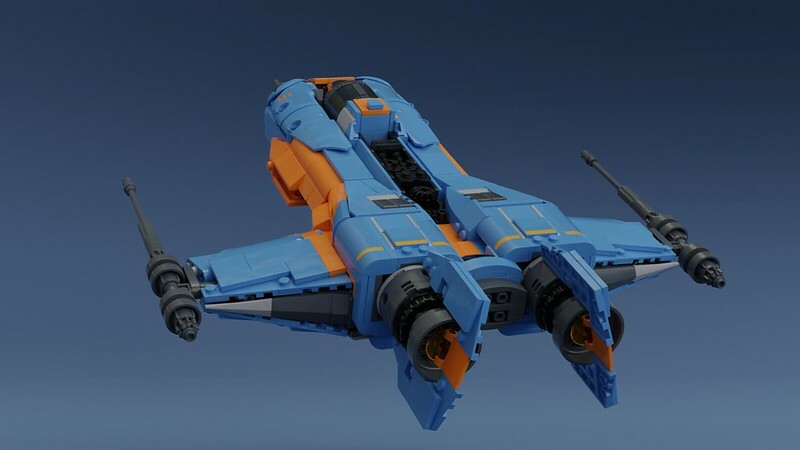 It’s a beautiful and simple ship that I hope one day gets the LEGO set treatment. I just really want a Hype Fazon minifigure. I love everything about Hype Fazon, especially his beautiful green racer. The custom stickers were a lot of fun to design, and they are easter eggs referencing many Star Wars media. 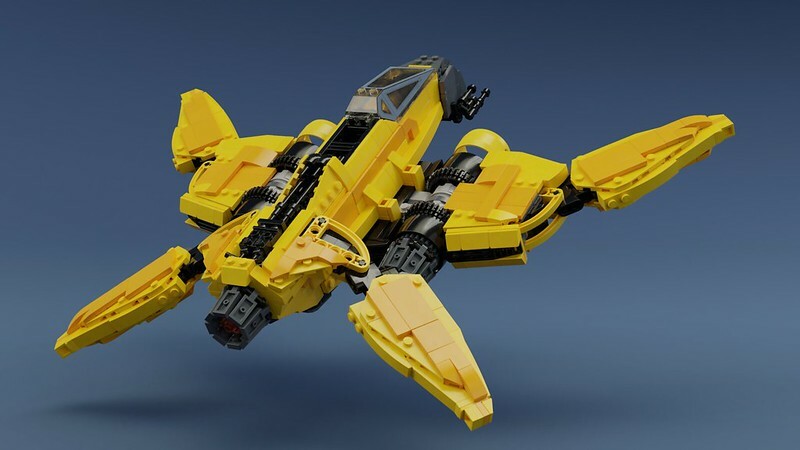 I love how the wings can be configured, and I can't decide which position looks better. The big Technic gear on each engine is connected to small bevel gears on the fuselage, which in turn are connected to Technic friction pins. This way the wings can be positioned evenly and can stay upright as well. It’s like a TIE Fighter and a Eta-2 Jedi Interceptor had an ugly baby. 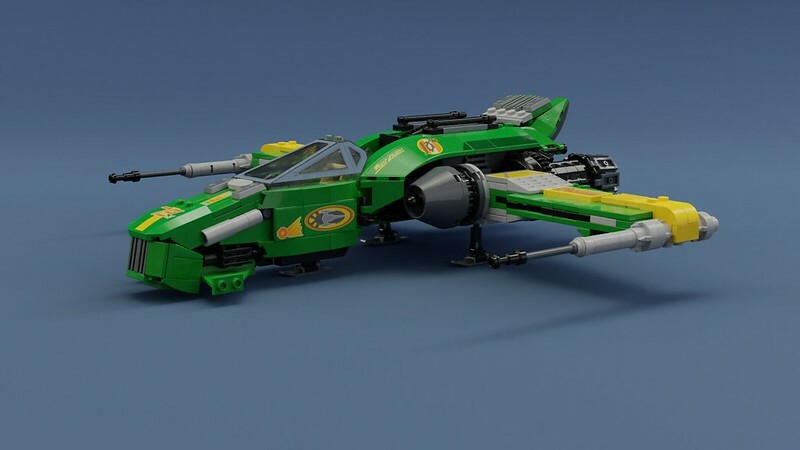 And the most recognizable starfighter from this show as instantly Star Wars. I love it. It was actually LEGO's own model (and the lack of Fireball) which inspired me to build the Aces. 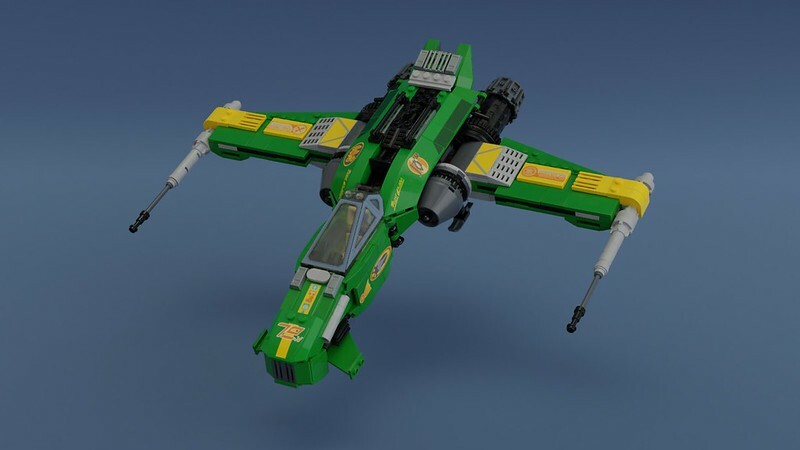 I’m not really happy with some design decisions on LEGO’s model so I went for a more accurate representation of the starfighter. I focused a lot on getting the Imperial helmet pattern to be accurate with sideways slope bricks. Once again I applied some custom stickers in a few spots. The cockpit area was tough because of the mishmash of all sorts of angles. 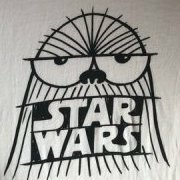 I want a Griff Halloran: A Star Wars Story. Please. 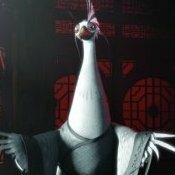 Griff is intriguing and sadly the show didn't give him the attention he deserves. Is he a former TIE pilot? Did he remain loyal to the Empire to the end? Did he fly at Jakku? Did he abandon the battle just like many Imperials did? Did he realize the evils that the Empire has inflicted on the Galaxy? How does he feel about fighting the First Order? I have so many questions. 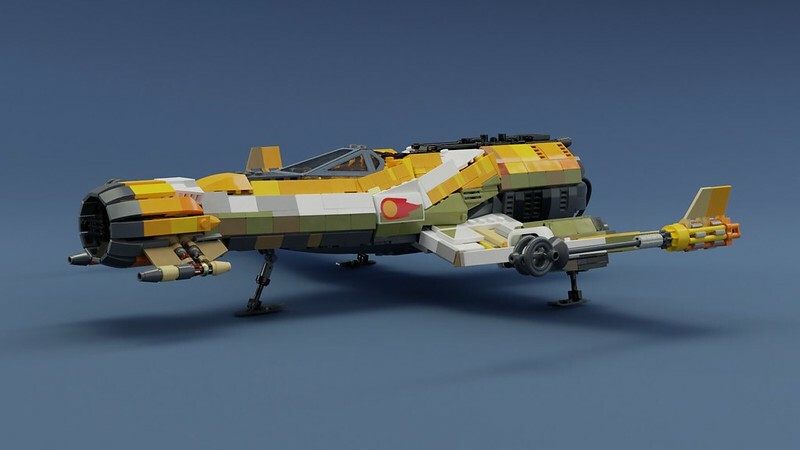 This starfighter was a fun one to build. Fairly simple body, simple engines, but with interesting poseable wings. 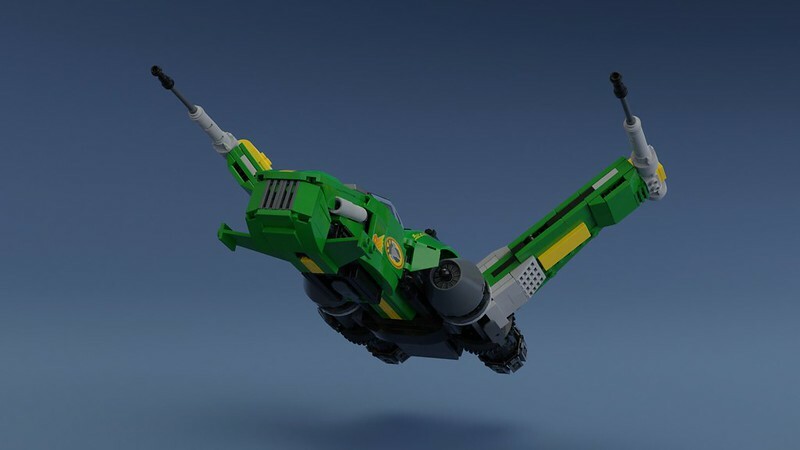 A lot of Technic pieces went into the internal structure of the wings stable and moveable, and the wingtips are attached with Bionicle ball-and-socket joints to achieve all kinds of configurations. Also, this is the only starfighter out of all six Aces that I didn’t have to design custom stickers for. Out of all the Aces, this was the easiest to design and build since it’s so small. I designed the front using elements of Jerac's beautiful A-wings and designed some custom stickers to convey the racing stripes. 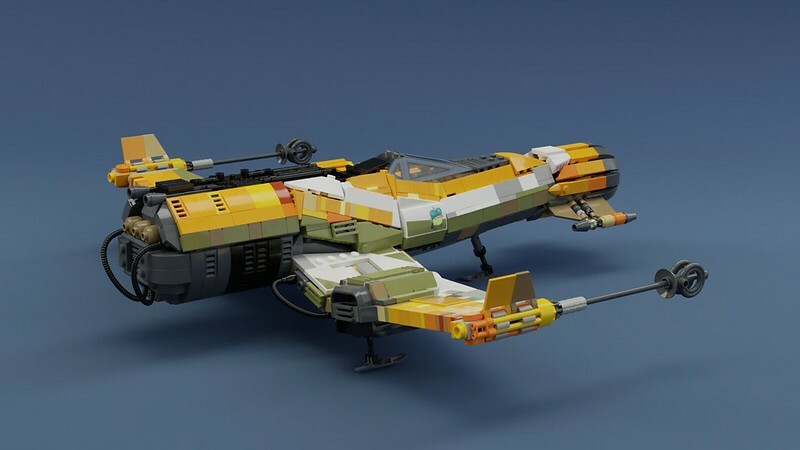 Despite being small and compact, I did challenge myself to pack complex building techniques to give the starfighter an overall smooth and slick look. 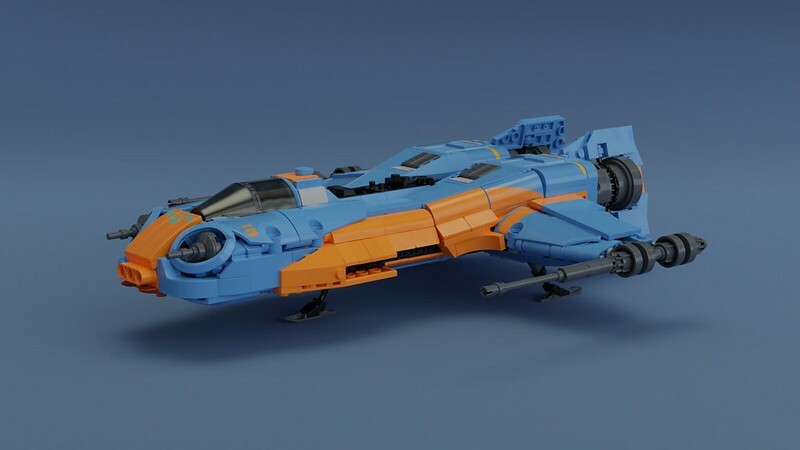 While it may be overlooked as simple and generic, this particular starfighter has become my favorite out of all of them because it's so simple and generic. It's small, it's slick, it's beautiful. 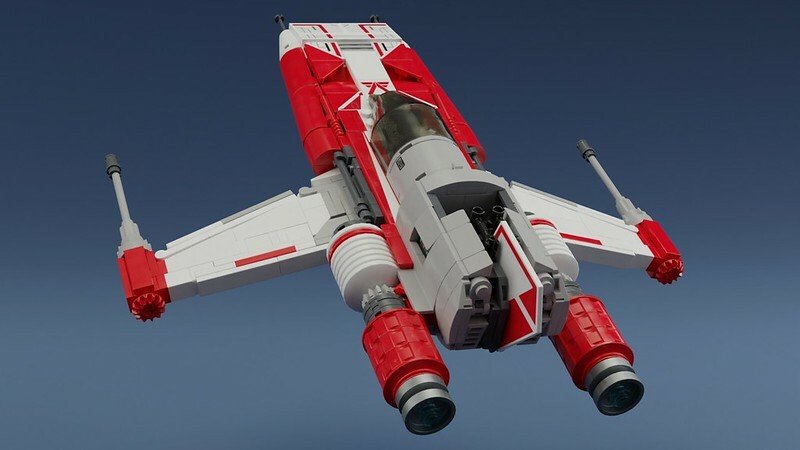 The front end is shaped well, reminiscent of an A-wing or a Y-wing. It's red and white. It's a true racer. Did I build it to be simple? Compared to the rest, yes. But these still have many compact SNOT techniques. 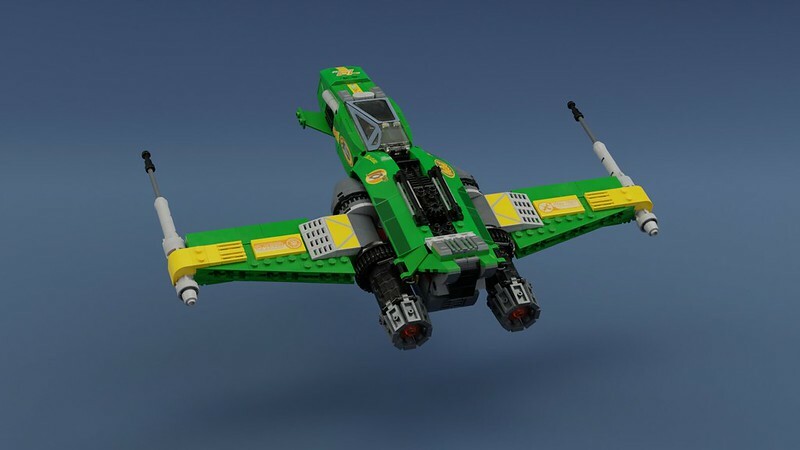 I have no idea how Jerac built the front of his A-wings, but I built this how I think Jerac built them. 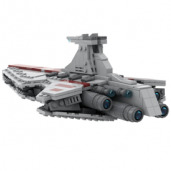 In that small space between the top and bottom shell of tiles, and between the two angled sides of curved bricks, it is packed with brackets, headlight bricks, plates with clips, and even lightsabers. 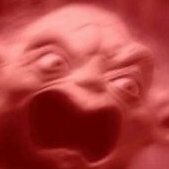 Coffee was really hitting when I was building that because I consider it one of my best work. Ah yes, the space Porsche 917K that has been the source of my headaches for the past six weeks. 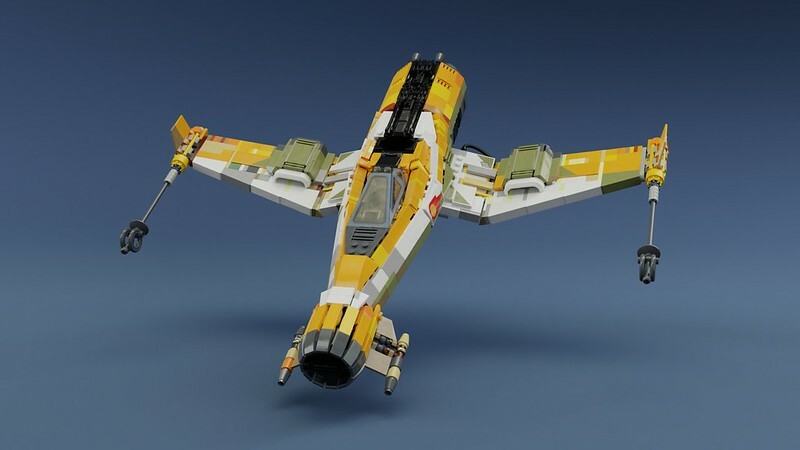 I really wanted to build this starfighter, but at the same time I did not want to build it because at the time I had no idea how I would achieve the curved front with the “Porsche headlights” and the rounded wings. 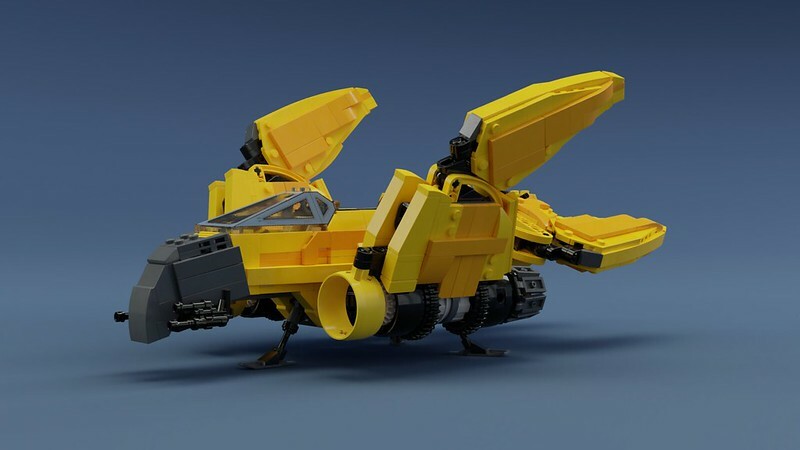 Six weeks of tinkering with all sorts of LEGO bricks and building techniques imaginable, I managed to capture its unique shape with clever solutions using Mixel joints and Technic panels. I never thought Technic panels and normal bricks would look good together, but in this case they’re almost seamless thanks to many curved slope bricks LEGO has produced in the past few years. 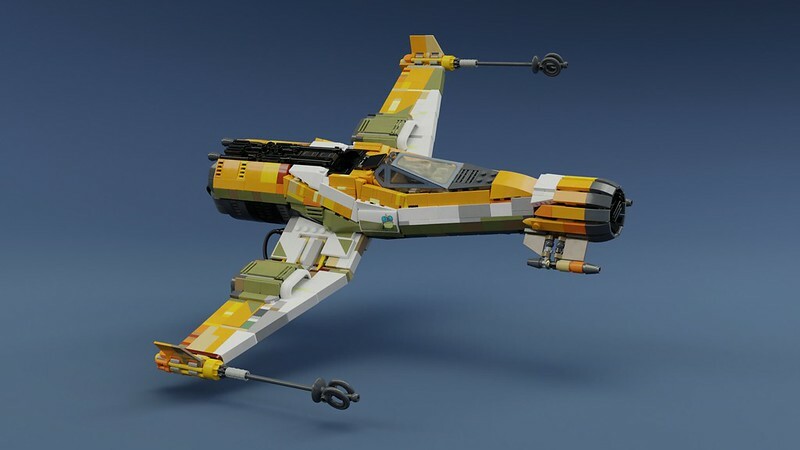 I’m curious to how LEGO will tackle this beautiful fighter, if they ever decide to make a playset of it. This is the most difficult MOC I have ever done, and I knew it would be. I had no idea how to go about this. I knew that I had to nail the "headlights" for the rest of it to work. I lost count of how many iterations I went through before the mudguards at an angle presented an accurate solution. 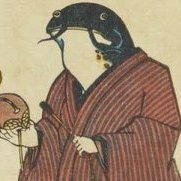 Color was also an issue, medium blue or medium azure? Each color has a lot of cool pieces that the other doesn't, but medium blue turned out to be more feasible. The wings were also a challenge, that took me many tries to get right, and everything else in between just fell in place. 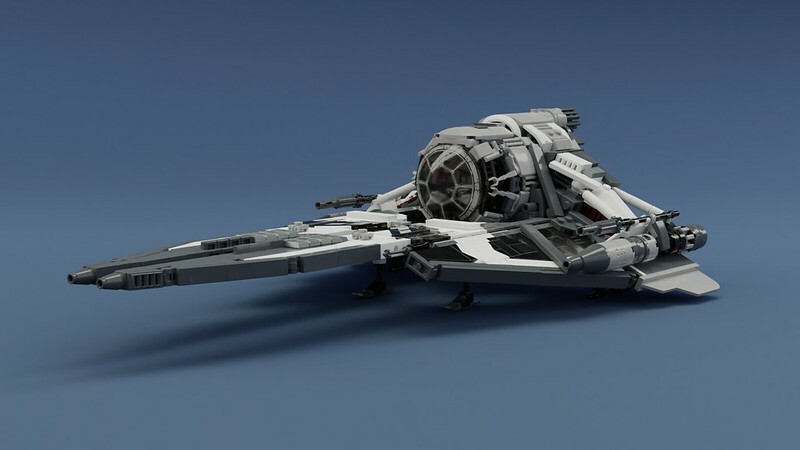 I'm thankful that I have been building Technic years prior, otherwise I probably wouldn't have thought of Technic panels as solutions for the curved exterior of this starfighter. I also took another piece of inspiration from Jerac with the engine section. 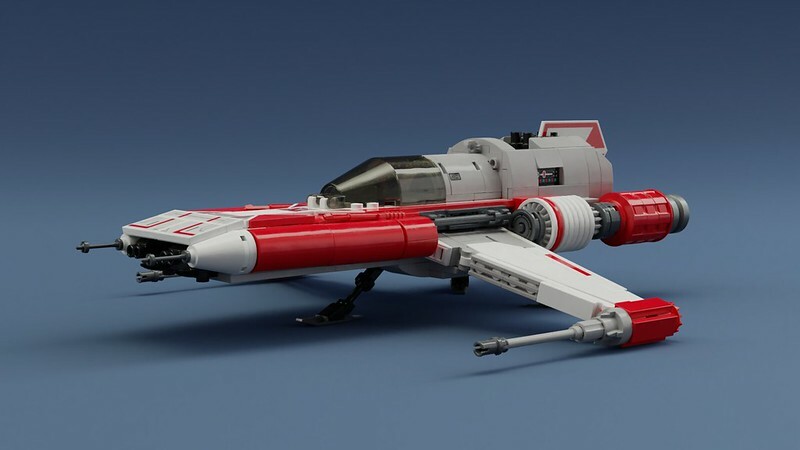 Influenced by World War II planes combined obscure starfighter designs from the old X-wing, TIE Fighter, and The Old Republic games, the Fireball is one of the best looking starfighters in all of Star Wars. 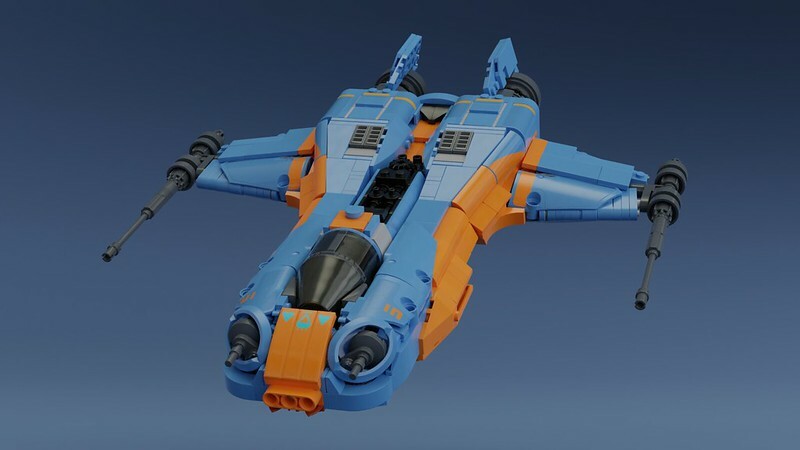 I am a bit upset that LEGO did not make an official model of the Fireball... yet. I hope they do in the future. This prompted me to design my own version, and it turned out more complex than I anticipated. But I like to build things to be a perfect match, which makes things complicated and challenging. I exhausted my brain to apply all kinds of building techniques to convey the complex shape of this ship. 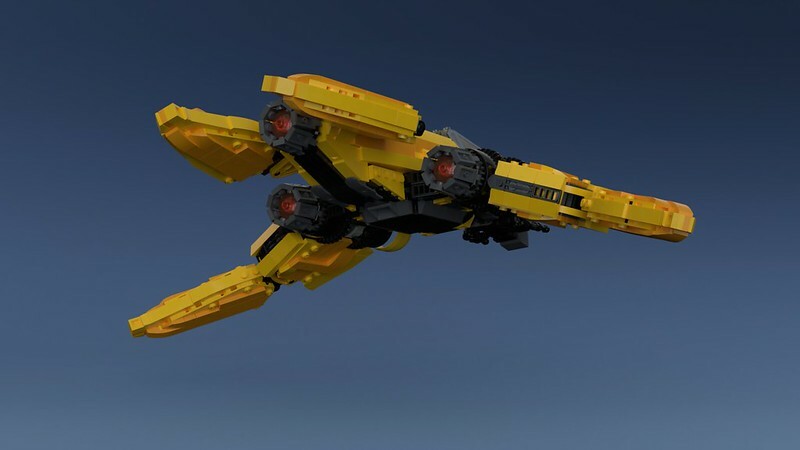 There are also some really ancient and obscure LEGO Technic pieces utilized in the complexity of this model. 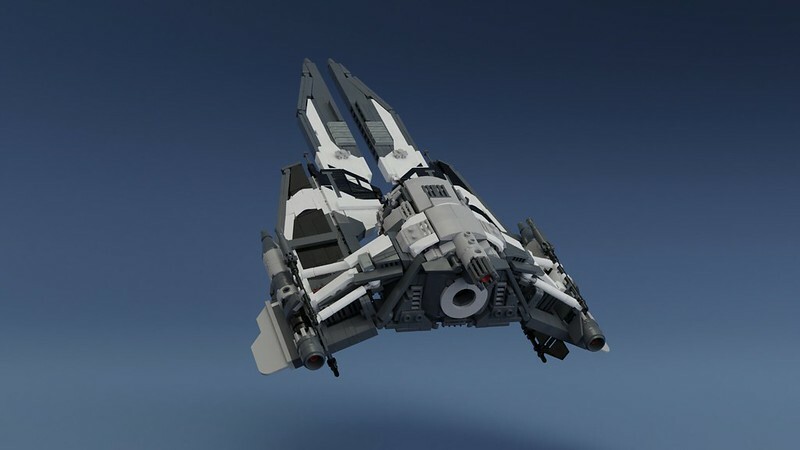 The front intake (which is probably not an intake) is a similar design I used for the engines of my Z-95 Headhunter MOC (which I derived from my Hungarian Parliament MOC, which I derived from the water tower on LEGO's Detective Office modular building.) While those used the 24T Technic gear and the tank threads, here I used pulley wheels and the new 1x1 round plates with the rods. 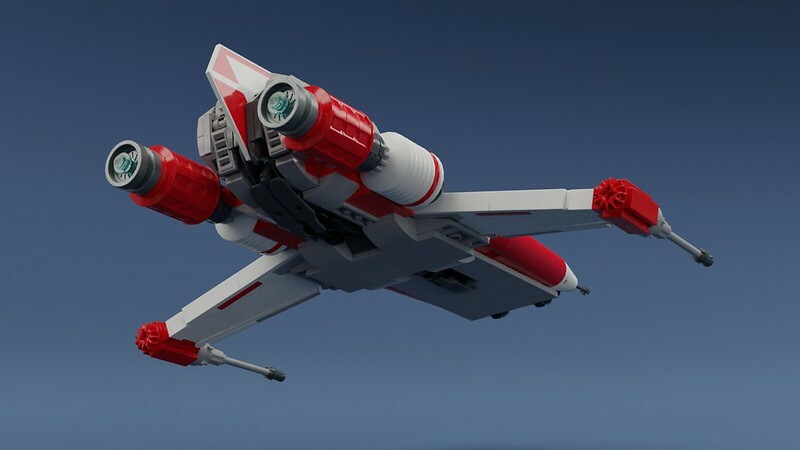 The rear end of this starfighter also uses a similar techniques. In between, classic hinges, plates with clips, and Mixel joints are used to achieve many complex angles. And it's a mess. And it's intentional, since the Fireball is a broken little racer. And finally, a group shot. Exceptionally well done! Every single one of them! The Black Ace moc really puts TLG's set 75242 to shame. Oh wow! I have just seen small fragments of the show, but these ships seem to be spot on! And even if they are not, I still think they look amazing. You did a splendid job on all six. My favourites? I would say the green en the red-white ones. I don't know what else to say besides these look fantastic! I like the red one the most, it favorably captures the simplistic styling of the OG trilogy! 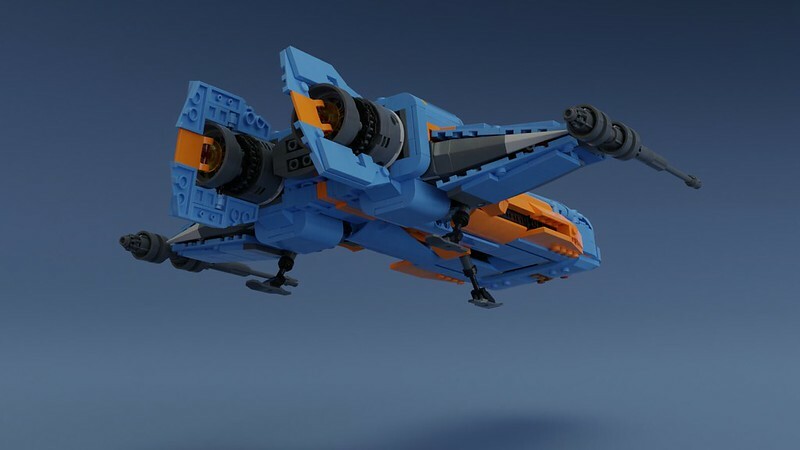 That Black ace tie looks so much better than the lego version, probably may favourite too! Hate the show, love your ships! exciting! 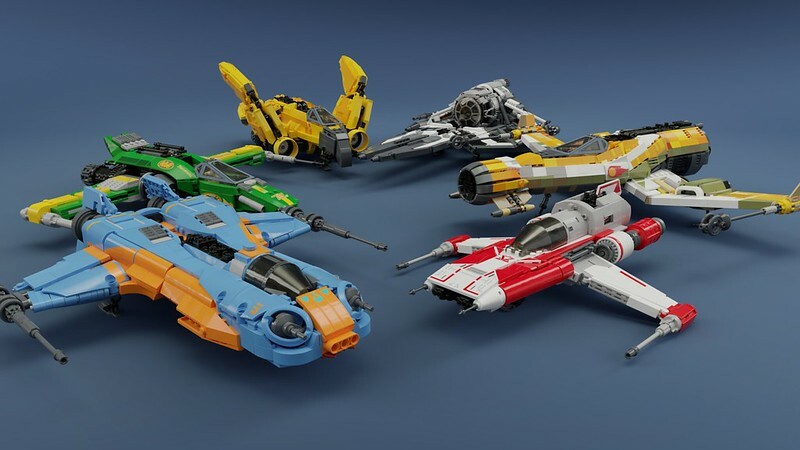 you did design much much better than LEGO sets may possibly release soon. Absolutely stunning, but out of curiosity how strong are the front panes of the Black Ace? Very well done, you’ve captured the look of all of them perfectly, it’s not easy to do that once let alone six times! Really impressive work!! Those truly are amazing, I think I like the Fireball the best. Not sure why, even though its beat up in the show, there is something about it. 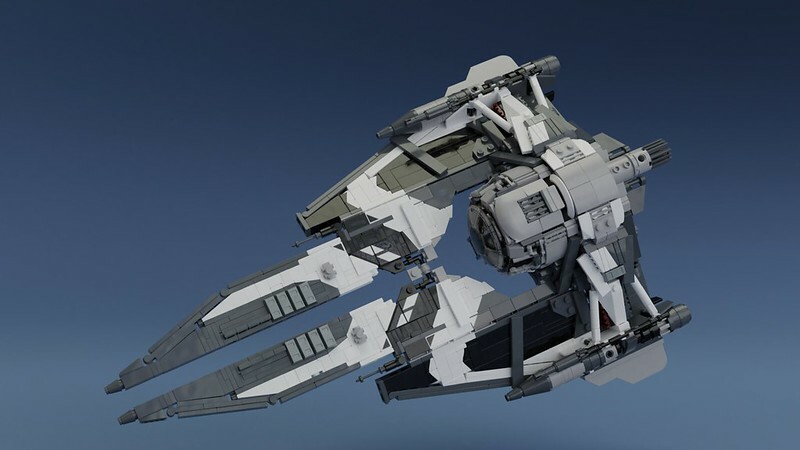 Any chance you are going to add Yeager's fighter as well? I know it wasn't featured much until the end, but it would look great with the rest of them. Congrats again, on some amazing MOCS! These are beyond perfect, man. Each ship is a flawless version of the ships in the show! Well done, you've created some masterpieces. Dumb question, are these renders or builds? It's hard for me to tell... Either way they're stellar. Love them all, but yellow ace is my favorite. I haven't seen Resistance, but these all look really interesting and well done. Might check out the show because of your MOCs! These are all excellent! Even if TLG makes a Fireball in the future, I am positive, it's not gonna look as good as yours! btw. I've seen the show, and i really like it. The style reminds me very much of the movie "Titan A.E." 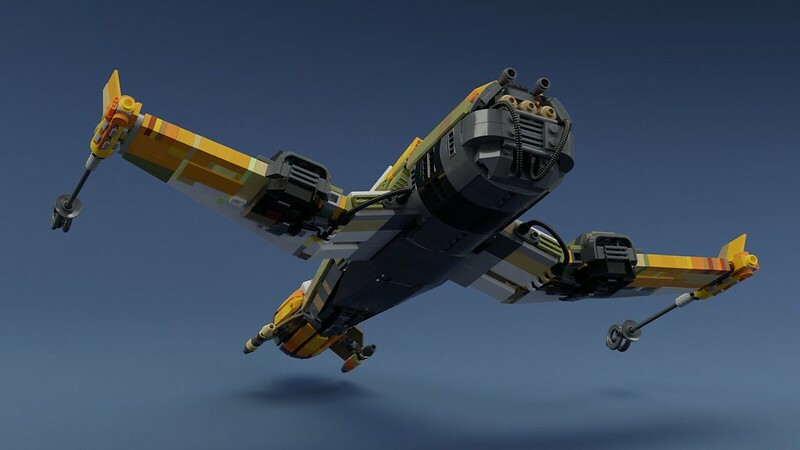 Any chance you are going to add Yeager's fighter as well? I know it wasn't featured much until the end, but it would look great with the rest of them. I thought about building Yeager's, Marcus Speedstar's, and Rucklin's racers as well but with these six, I already had enough on my plate. I may build them in the future, but who knows?